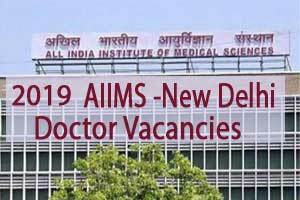 New Delhi: All India Institute of Medical Sciences (AIIMS), New Delhi has recently released a notification for 48 vacancies for the post of Junior Resident (Non-Academic). The Selection will be made on the basis of Walk-in-Interview. Walk-In-Interview will be held on 30th April 2019 at 09:30 AM. Subject: Special recruitment drive for UR/OBC/SC/ST candidates for the post of Junior Resident (Non-Acad.) – (for the remaining period up to 30.06.2019). The All India Institute of Medical Sciences, New Delhi is an Autonomous Body established under an Act of Parliament. As a part of its activities, the Institute is running a large teaching hospital for training of undergraduate and postgraduate students in the various fields of Medical Sciences. Applications are invited from Indian Citizens (including OCI/PIO) for the posts of Junior Resident (Non-Academic) in the speciality as indicated against each for the candidates belonging to the UR, OBC, SC and ST in level 10 of pay matrix (pre-revised pay band-3, Rs.15600/- + 5400/-(GP)) with entry pay of Rs. 56,100/- per month plus usual allowances as admissible. The last date for submission of application for these posts is 26.04.2019. It may be noted that the opportunity for counselling/selection will be permitted initially to remaining waiting list (*) candidates for JR (NA) post for January, 2019 session. In the event of any shortfall in the panel of JR (NA) from the waiting list candidates, the candidates applied afresh will be considered. Candidates must note that NO SEPARATE INTIMATION WILL BE SENT FOR THE COUNSELLING. The Vacancies are in the Department of Surgery (Trauma Centre), Rheumatology, Radiotherapy, Radiology (Trauma Centre), Psychiatry, Pediatrics (Casualty), Neurosurgery (Trauma Centre), Neurology, Nephrology, Emergency Medicine, Community Medicine, Burns and Plastic Surgery. Pay Scale: Pay matrix (pre-revised pay band-3, Rs.15600/- + 5400/-(GP)) with entry pay of Rs. 56,100/- per month plus usual allowances as admissible. Note: Remaining waiting list candidates, who have attended counselling held on 02.04.2019, are not required to apply, they will be called for counselling directly as per their merit in waiting list. The form can be downloaded from the Institute web sites www.aiims.edu, www.aiims.ac.in and www.aiimsexams.org. The offline application form can also be obtained from Academic Section from 10:00 AM to 04.00 PM on all working days and from 10.00 AM to 12.00 noon on Saturday. Duly filled in application form should reach to the undersigned latest by 26.04.2019 (Friday) by 12:00 NOON. Late and incomplete applications will not be considered. The Counselling of candidates for allotment of these posts will be held on 30.04.2019 (Tuesday) at 09.30 AM in the Jawaharlal Auditorium/Conference Hall, AIIMS, New Delhi. 1) The candidates should have passed MBBS (including completion of Internship) or equivalent degree recognized by MCI. 2) DMC is mandatory before joining, if selected. 3) Only those candidates who have passed MBBS (including Internship) not earlier than three years before the start date of Junior Residency (Non-Academic) i.e. 01.05.2019 will be considered. It implies that those who have completed MBBS or equivalent course (including completion of residency) between 01.05.2016 to 30.04.2019 only will be considered. 4) Candidate should bring all Original Certificate – Degree, Internship Completion certificate, Date of Birth, Caste certificate and MCI/DMC registration for verification, without which no candidates shall be permitted to appear for the Interview. The original certificates i.e. MBBS/BDS Degree Certificate and Medical Registration Certificate of the candidate who joins as Junior Resident (Non-Academic) will be retained in the Academic Section. The same will be returned to the candidate on completion of tenure of the post i.e. after 30TH June, 2019 or after resignation (after obtaining all no dues from the concerned Department/Sections of the Institutes). 5) Other terms & conditions of service/recruitment shall remain same as indicated in the Advertisement published for January, 2019 session. 6) The number of vacancies indicated against each post/category is provisional and may vary at the time of selection without any notice.